God bless you, Mr. Carmody. You’re right: the end of EPIC 2015 was the real payload. It’s the only place where color intrudes. And it’s that feeling: green shoots pushing up through cracks in the concrete. Nobody ever mentions it. Maybe nobody watches it all the way to the end? What a post. I like Tim on voice recognition. Look at those paragraphs. Those are real paragraphs! “Getting a chance to play with the neighbor kid’s Lego set, and he has all the Legos” is doing it for me, too. Hmmm how do we acquire or make more Legos. How do we share them. These are the right questions. It might be a leaky rocketship, but the pilots are still pulling my capsule along (if that metaphor makes any sense… basically, I’ve learned a ton from you all). Congrats on 11 years of Snarkmarketing! Oh, Tim. Happy birthday. You finding Snarkmarket was a birthday gift to the Internet. There came a point pretty early in the life of Snarkmarket, after you and a happy band of others had found us, when I blogged in some large part for the terrific pleasure of seeing your responses. 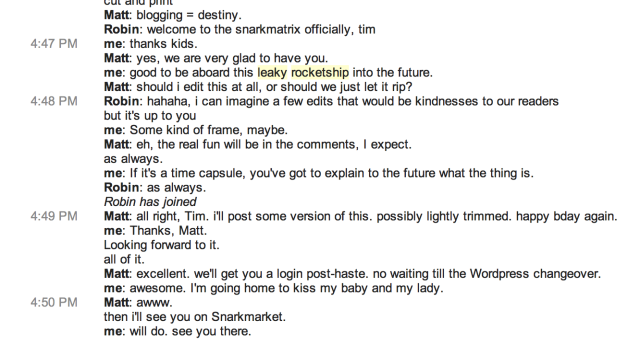 Snarkmarket was a way of summoning these magical Internet people out of their lamps and into my life, and how wonderfully it has succeeded at that. Nine years ago now, this leaky rocketship was the only place I could imagine sending a note to myself 10 years into the future. And sure enough, it’s still here – the rocketship – a letter to the future and the past, traveling in both directions at once. Ten years hence – 111 years hence – I also hope to find it, and you, playing with Legos. Happy birthday to all of this, to all of you.